Using my shamanic vision and intuition, I can provide insight and practical advice for any situation. Often, you are so involved with a problem or hardship that you cannot readily make sense of the situation. This oracle session can help you to understand your life in new, meaningful ways, while providing key considerations to help you make favorable choices and uncover deeper patterns and connections. Please complete this form & click to pay securely through PayPal. • 7 card Medicine Wheel Spread: cards 1-4 describe the life lessons respective to the directional medicine (mental, spiritual, emotional and physical). They each are an opportunity to learn a life lesson. Cards 5-7 describe the alchemical process of growth you experience while learning lessons 1-4. The alchemy at the center of the wheel sheds insight onto each of the cardinal opportunities, and as you integrate lessons 1-4 the alchemy at the center becomes stronger. 1) The Alchemy Oracle is 70 cards. It combines five elements (air, fire, water, earth, storm) with numerology (0-10,11,22,33) to expertly track the energy of your inquiry. 2) The Shaman Sight Oracle is 55 cards. Each card depicts a shamanic insight to your soul lessons and life experiences. I created each card using collage techniques for vivid imagery and clear depictions that reflect my shamanic insight into the human experience. • Commentary on collective significance and relational components, including elemental imbalances, mirrors and micro/macro components. There is a larger theme that runs through all oracle readings. 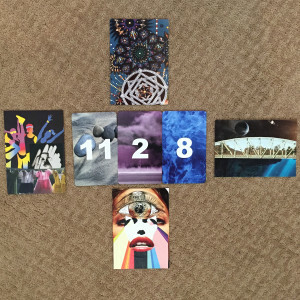 Theoretically anyone can pull several random cards to tell you what they each mean, but it is understanding relationships and tracking the energy of cards that requires training, skill and talent. • Action steps and journal prompts that will integrate the oracle reading into your daily life. This reading is designed to tell you HOW to move forward, but not necessarily WHAT choices to make. I believe we are individuals of free will and it would be dishonorable to your soul to assume I was in a better position to make your life choices. By advising you on HOW to make those decisions and WHY you are making them, I am very confident that you will be able to clearly identify and choose the appropriate action for your highest and finest good. The shamanic oracle reading I provide is very different from a tarot reading or other forecasts and oracles with which you may be familiar. The focus of this reading is to track the energy patterns of your inquiry. Although there are elements of physical health, negative emotions and relationships, it all comes back to Spirit. Everything is explained in a non-dualistic way that empowers you to co-create and accept responsibility for your life in line with the natural order. To order your reading today, simply complete this form and process your payment securely through PayPal. Within 48 hours, I will contact you directly via e-mail to confirm your order. You will respond to that e-mail with your main question. Your reading will be sent as a .PDF document. Your perceived outlook fails to see the interconnected nature of reality. The bridge helps you to move energy about here and there, forging new insights and abilities as you bring together what seems to be disparate elements in your belief system. Honoring the bridges that connect you will give you strength and stability. Remember: as above, so below – one and the same. The ability to compare yourself in, not out, will transform your life. Spiritual advancement is possible. The opening up though is a process, not an event. Watch carefully for small changes in all of your 5 classical senses as they will indicate your ability to perceive in new ways. The real lesson of experiencing your third eye is integrating the wisdom of the divine into your mundane life – spiritual in the physical. Emotions are not external things, nor are they free-floating projections. Examine your emotions as though they are chapters in a book, one leading into the next. Look at the transitions, the ups and downs. Dance is also a literal lesson. Your emotions need movement to be fully expressed. Put anger, fear, joy, surprise and sadness into a physical movement. Yoga, tai chi and other eastern traditions already express this lesson. The events of your 3D reality are also symbolic. Look at the relationship you have to personal objects, your career, your residence and other possessions. The nature of your having needs a closer examination. There is no exact amount defined for good balance. You will have to make some big decisions this year between what will appear like clear opposites, both of which may seem viable. The storm element is a dynamic progress of elemental balance that will be exaggerated. Choices will seem more extreme. Make choices based on your passions and spiritual beliefs, bringing in the element of fire that is notably absent from this entire reading. Every relationship has ups and downs, so remember to stay grounded and centered, honoring your commitments. Stick with the long-term relationships, continuing close relationships will pay off in the long run. No matter what emotional experiences surface, accept them at face value and seek a higher understanding. Do not over-identify with any of your extreme emotions. Use the the lessons of the East, South and North to integrate this card with your West lesson. Journal Prompts – Answer multiple times throughout the year. 1. What changes need to be made to your decision making process? 2. In what part of your life can you accept more responsibility? 3. Your emotions need a physical outlet, your attitudes and beliefs are looking to make new connections, and the physical world around you is asking for new understandings. How can you creatively express yourself in new ways this year? 4. Where are you procrastinating in your life? 5. What excites you about your life? What doesn’t? Live your passion. 6. With the changes that are happening, physical movement is almost required. If exercise doesn’t sound appealing, find more creative ways to find physical movement. Make a commitment you can keep. You can always add more intense activity, more time on the treadmill, etc. 7. What contrasts are you experiencing? How can you unite them as equal truths? You are coming off of a very exciting and powerful year. The momentum will bring you to new challenges and new situations that need creative problem solving. The lessons and insight you have gained will need applied in new and meaningful ways. The North Medicine – Mandala is of particular importance for over-all understanding of the coming year, but it may now precipitate until the other three cardinal medicine lessons have passed and closer to the end of the calendar year. Remember that Spirit will not give you more than you are capable or ready of handling; maintain your trust and faith to move forward no matter the test. You may also want to work with the serenity prayer or other affirmation that will help you to stay focused on your life path without attachment to what everyone around you is doing. The ultimate aspirations indicated by the oracle are resiliency, endurance and ingenuity.